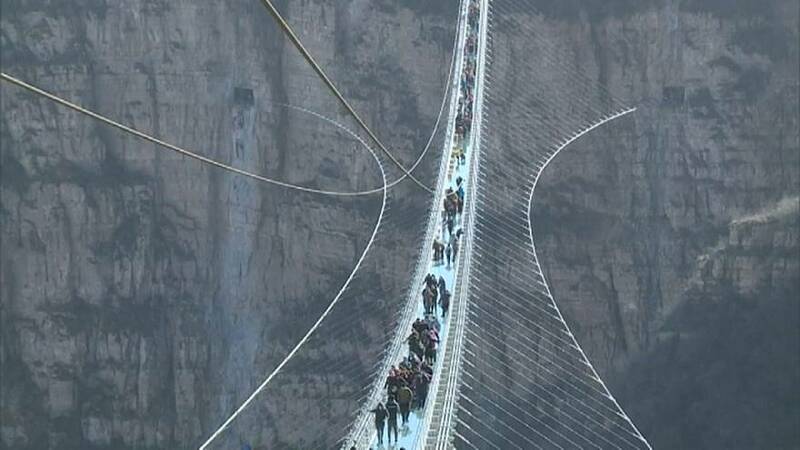 More than 3000 curious Chinese turned up for the inauguration of the world's longest glass-bottomed bridge. Located in the scenic Hongyagu area in Pingshan County, north China's Hebei Province, it features a unique geographic landscape with mountain views, natural waterfalls, ancient towns and temples that people can now enjoy from 218 metres in the sky, with nothing in between them and remarkable views. "I think itis very impressive. We do not regret climbing so much to witness this bridge -- on top of the world! It is such a happy feeling." "Our glass-bottom bridge has been designed to hold up to 3,000 people. To ensure the safety of all the tourists, we only accept 600 at one time during the operation," said the Deputy general manager of Hebei Bailu Group, Yang Shaobo. Over a thousand four-centimetre-thick slabs of glass make up the 488 metre-long bridge, which is designed to resist a force 12 wind or a magnitude six earthquake.